If you are new to kettlebell training then beginning with the basics is very important. You will get excellent results by mastering the fundamental kettlebell movements and performing them well. 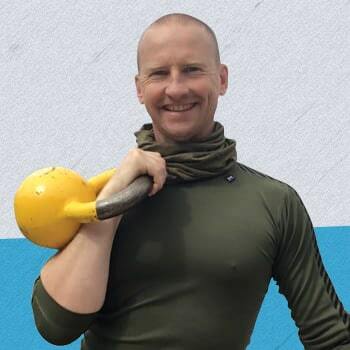 Here is a list of my favourite kettlebell workouts for beginners. Remember that form and technique are very important. If you find that you get tired or start to lose your technique during any of these workouts then please stop. Start by taking 1 days rest after any of these workouts so you always give your body time to recover. Less, in this case, is more! A very simple but effective way to improve your Swings as well as Cardio. Perform 20 seconds of Double Handed Swings followed by 10 seconds of rest. Work up to 8 rounds for a total of 4 minutes. Begin with 30 seconds of One Handed Swings on the left side and then 30 seconds of the Slingshot. Next 30 seconds of One Handed Swings on the right side and then 30 seconds of the slingshot. Continue alternating sides and using the slingshot between swings. Work up to 8 rounds on each side. Swing the kettlebell for 20 reps and then perform 20 fast mountain climbers (20 reps on each leg). Repeat the pairing for a total of 10 rounds and 200 swings. This is a motivational little workout that is super simple. Start with 10 Double Handed Swings followed by 10 Goblet Squats. Repeat both exercises for 9 reps, then 8 reps, then 7 reps, all the way down to 1 rep each. At the end you will have completed 55 Swings and 55 Goblet Squats. Set your timer to beep every 60 seconds. Perform 20 reps of the Double Handed Swing at the start of every minute and then rest for the remainder of the minute. Continue for 10 minutes and a total of 200 swings. Simple workout to improve the first part of the Turkish Get Up. Perform 5 reps on each side 5 times for a total of 25 reps each side. Work on keeping your heel on the floor throughout the exercise and returning to the starting position nice and slow. Fundamental way to become great at the Turkish Get Up. Start with 1 rep on each side, then 2 reps, then 3, and so on. See how many reps you can complete on each side without putting the kettlebell down. If you can make it to 5 reps on each side then start coming down again, so 4 reps, then 3, then 2 and finally 1. Climbing all the way up to 5 reps and back down again is a total of 25 reps each side. Double Handed Swing for 20 reps followed by 1 Turkish Get Up on each side. Repeat for up to 10 rounds and 200 swings and 10 Turkish Get Ups each side. A fun way to keep your workouts interesting, using the 2 most fundamental kettlebell exercises, the Swing and Turkish Get Up. Throw 2 dice or one twice. Add a zero to the first so if you throw a “5” that’s 50 swings and use the second for the number of Turkish Get Ups. So if you throw a “5 & 2” that’s 50 swings and 2 Turkish Get Ups each side. See how many rounds you can complete in 20 minutes. A simple but effective circuit that helps you work on your flow from one exercise to the next as well as the basic exercises. Swing for 30 seconds on each side followed by Pressing each side, then Clean each side and finally Squat each side. Set your timer for 30 seconds each side and try not to put the kettlebell down or stop and rest. The whole circuit takes 4 minutes. Work up to 3 circuits resting for 60 seconds between circuits. The same format as the workout above except using slightly more advanced exercises. Move onto this circuit once you can comfortably complete circuit #10 3 times. Again similar to the workout circuits above except this time you perform all the exercise on one side before changing and performing them all on the other side. You will find this circuit more difficult than the ones above because it overloads one side of the body. A circuit based workout but this time 60 seconds on each side and a rest after each exercise. So Turkish Get Ups on the left for 60 seconds then immediately onto the right for 60 seconds. Next rest for 60 seconds and then move onto the next exercise. You can make this workout even more challenging by adding in 10 burpees into the 60 second rest period. This workout only lasts for 7 minutes. Perform a circuit of: 20 Double Handed Swings, 20 Bob & Weaves and 20 Fast Mountain Climbers, as many times as possible in 7 minutes. Another 7 minute workout that uses the same format as the one above. Complete all 3 exercises as a circuit for 10 reps each. Complete as many circuits as possible in 7 minutes. Gain strength quickly by performing the Clean and Press for 5 reps each side, as many times as possible in 15 minutes. Once you have mastered the Clean & Press work on adding someextra weight an really challenging yourself. Using this ladder format is another way to gain strength very quickly with the Overhead Press. Begin by pressing 1 rep on each side and then 2 reps and then 3 reps, then 4 and finally 5. Next keep pressing as you work your way back down to 1 again. Once completed you will have Pressed 25 reps on each side. Using the same format as the above workout you can build up your core strength and flexibility by increasing the amount of reps you perform each round by 1. Work up to 5 reps and then back down again if possible for a total of 25 reps each side. Work your core hard by performing 5 Half Get Ups on each side followed by 30 seconds of the front plank. Work up to 5 rounds and 60 seconds of front plank for each round. Begin with 30 seconds of the Side Plank on each side followed by 60 seconds of the Sit & Press. Your eventual goal is 60 seconds of the Side Plank each side and 5 complete circuits. Set your timer to beep every 30 seconds. Begin by Swinging for 30 seconds. Next rest for 30 seconds. Then Swing for 30 seconds and Goblet Squat for 30 seconds. Rest for 30 seconds. Continue adding an exercise each round until you complete all 4 exercises before resting. Next come back down the ladder by removing an exercise each round from the front of the list. The same format as the workout above except this time the Swings and Lunges are one sided so you would perform the left side on the 1st round and the right side on the 2nd round and continue alternating sides throughout the workout. A motivational circuit that starts with you performing 10 reps for every exercise. Next complete the circuit for 9 reps, the 8 reps, then 7 reps and so on down to 1. At the end of the workout you will have completed 55 reps of each exercise, that’s a total of 275 reps. Time yourself completing the workout and see if you can finish it quicker next time. This circuit follows the same format as the workout above except that the Windmills, Lunges and Squats are all performed on alternating sides each round. For example, 10 Windmills Left, 9 Windmills Right etc. A demanding movement ladder that adds a new exercise into the circuit every round. Start with 30 seconds of Fast Mountain Climbers, then rest for 30 seconds. Next 30 seconds of Fast Mountain Climbers and 30 seconds of Double Handed Swings. Continue adding an exercise each round until on the final round you are performing all 7 exercise without a rest. If you are feeling brave you can then come back down the ladder by reversing the format and removing an exercise each round. When you first start training with kettlebells it is important to work on the basic exercises. The better you can become at the basics the more effective your kettlebell training will become and the less injuries you will receive. 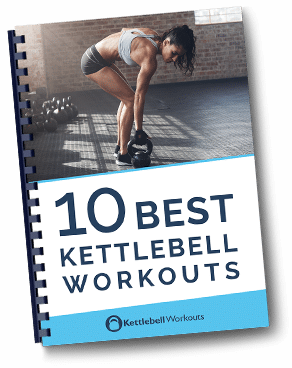 With this selection of kettlebell workouts for beginners you now have no excuses to ever get bored or reach a plateau with your training. Yes, DVD’s would be excellent and some for women too! I know I’d buy them!!!!! Thanks for all these great resources. Could you suggest a way of adapting your 25 free workouts into a weekly all round programme? Hi Tony, the workouts are in no particular order so my first suggestion would be to work your way through the list performing a workout every other day and taking the weekends off. Once you have finished this then you can start to work on improving your weight for each workout. What about making a DVD with some of these workouts. Definitely would be a seller.